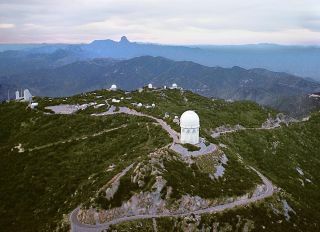 This 1993 aerial photograph of the Kitt Peak mountain, some 50 miles WSW of Tucson, Arizona, shows the then current state of the large collection of telescopes maintained and operated by the National Optical Astronomy Observatory. I'm following college kids to a warmer clime this spring break. But instead of shotgunning beers, I'm spending my late nights getting cozy with a 2.4-meter telescope in the Arizona desert. This week, I left the light pollution of New York, and headed to Kitt Peak, a mountaintop dotted with white observation domes about 50 miles (80 kilometers) southwest of Tucson, Ariz., inside the Tohono O'odham Nation reservation. I'm shadowing Columbia University astronomy professors Joe Patterson and David Schiminovich, along with some of their undergraduates, who have reserved time at the MDM Observatory, a tenant at the NSF-funded Kitt Peak National Observatory. On a clear night in Manhattan, you'd be lucky to see 40 stars and planets. I haven't escaped the New York area long enough to make more than a casual acquaintance with the few visible constellations. I've never seen the seam of the Milky Way, and until a few weeks ago, I'm embarrassed to admit, I had never even peered through the eyepiece of a telescope. Ahead of the trip, I've been trying to strengthen my frail grasp of what it means to do astronomy, rather than merely report on it. On a recent night on the rooftop of Columbia's Pupin Hall, Patterson helped me set up a Dobsonian reflecting telescope that owes its simple mechanical design to Isaac Newton. Patchy clouds were rolling in so we pointed the telescope at an easy target — the moon — and looked at the Bay of Rainbows, an ancient basin of lunar lava abutted by a ridge that resembles Cape Cod. The buildings around us were giving up their heat after a mercifully warm day and columns of unstable air made the edges of the moon quiver like it was trying to break loose from the sky. I asked Patterson about the best kinds of observing environments, wondering what else makes Kitt Peak so great besides its dark skies and high altitude. He said, with dry optimism, that the best place for a telescope is wherever you have a telescope. We couldn't crane the neck of the Dobsonian far enough to catch Jupiter, our only other viable target high overhead. Instead, we improvised and studied a red lamp illuminating a crucifix on top on Riverside Church at 35x magnification. At Kitt Peak, from more than 6,000 feet (1,800 meters) above sea level, I'll be engaging in some astronomical tourism, learning how to make observations of celestial bodies with the 2.4-m Hiltner telescope and the 1.3-m McGraw-Hill telescope. I might even get to take images and spectra of the new supernova that appeared in in the galaxy Messier 82 earlier this year — and talk to researchers who are making more serious efforts to do so using other telescopes on the mountain. But maybe what I'm looking forward to most is a rare shot at great skywatching with unaided eyes. Check back on Space.com this week for updates from my astronomy spring break.